The most amazing and loving husband – Dave. He has spent all our years pressing in to know me and love me. His love covers me. His touch heals me. My children: Tara, so passionate and her beloved, Dave the powerful, watchful; Stephanie, so sensitive and her gentle and strong Tristan; Mighty Tredessa, out loving the world for Jesus Christ; Rocky, my amazing son and his beauty, Jovan; Stormie my baby, true and real. AND my grandchildren: Gavin and Guini and Gemma, Hunter and the baby girl to be…You’re the reason I was born. The friends who have stayed true when I wasn’t worth their effort and who refused to be swayed by my hopelessness, but pushed me back into the light – you know who you are. Heritage – all the people before -who influenced all the people before -who influenced all the people who would influence me. I come from the good, the bad and the ugly, but also the rich in spirit. It is the gift that my grandparents and parents passed on to me – coming from insurmountable odds – to give me the sweet life I have not deserved, but so enjoyed. It is siblings who are worthy of my greatest admiration. I have gold to pass on. My treasure has no value on the open market. My treasure is in the faces of the people I love, the letters with their kind words, the pictures small hands have painted for me. My riches aren’t even the thoughtful and loving gifts my family bestowed upon me on Christmas morning (though they divined my true needs, my heart’s desires in the most carefully attentive way), but the time they sanctified, the hours they set apart to spend with me. My fortune is in the minutes I collect from the people I am most passionate about – this is the true measure of my wealth. 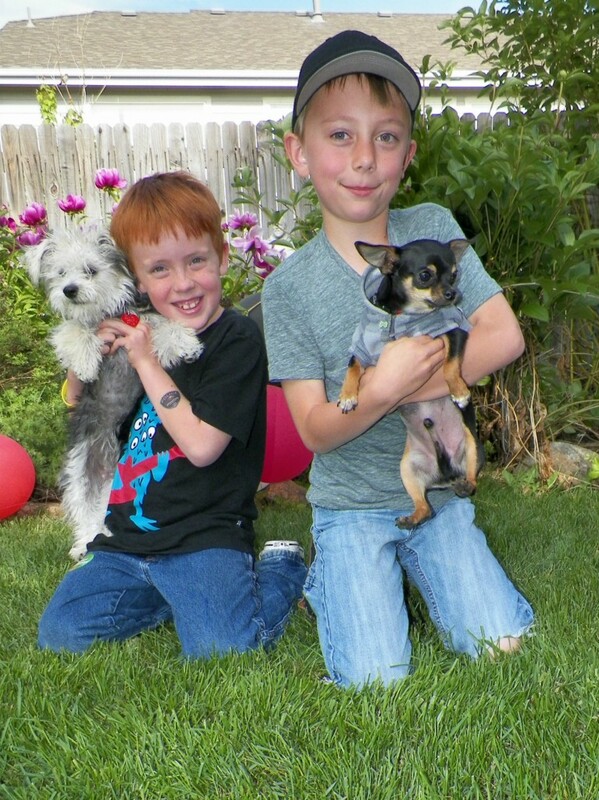 Gavin holding Tuppy-thePuppy and Hunter corraling Steve. Steve Holt, the dog. Have added a son-in-law and a couple of granddaughters (not to mention the granddogs) and lots of living. The treasure is increased. Sometimes I read myself and think: wow, that’s good! :) Come on, “My fortune is in the minutes I collect from the people I am most passionate about” ??? That is hilariously zealous, people! Oughta be on Pinterest or something.